Ms. Drissi has been working in the field of international cooperation with particular focus on agricultural policy, food security and environmental issues for the past seven years. After gaining work experience on international marketing and communication in Netherlands, Spain and Italy, she obtained a MSc in International Cooperation and Sustainable development from the University La Sapienza, Rome. For her field research, she designed and implemented a quantitative and qualitative study on Local Economic development Agencies (LEDA) services’ impact on beneficiaries’ life (financial ones through micro credits, and non-financial ones such as technical assistance and training), in Honduras, Nicaragua and El Salvador. She then worked for two years as a project designer and project manager in CIRPS, the Inter-university Research Centre for Sustainable Development based in Rome. Since then, she’s been working as a consultant for FAO (the Food and Agriculture Organization of the United Nations) in Rome, Central Asia, Kenya, and now in Egypt dealing mainly with functions related to coordination as well as national and regional programs. Also Ms. Drissi has been collaborating with a research project analyzing the National Program for wildlife conservation in private lands in Mexico. Her expertise on market studies and national strategies and programs contribute towards the analysis of commodity values chains and the implementation of effective conservation measures linking private community and public stakeholders. 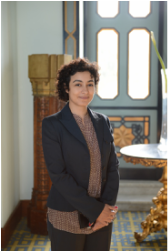 Among Ms. Drissi’s research Interests are : food security issues and their environmental interlinkages, right to food and indigenous people, international aid effectiveness, programme coordination strategies and effectiveness.